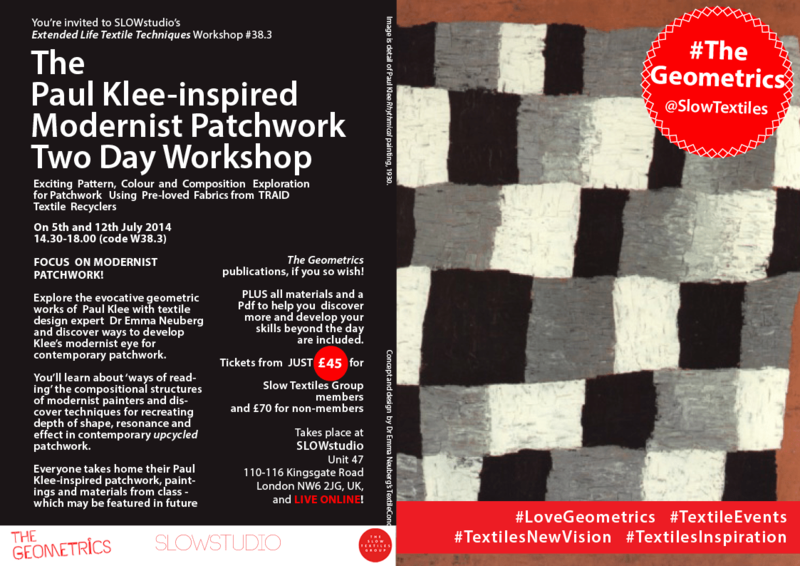 The Geometrics Patchwork 2 Day Workshop July 5th and 12th! Online Attendance Tickets are available for your convenience from just £45 (Slow Textiles Group Members’ price). We use Google+ Hangout which is easy to use (all you need is a Google+ account). Alternatively, come to the London studio to gain the full experience of an exciting professional textile design studio, personal tutoring, group experience and learning, Slow Textiles handouts and realia, new work made with professional materials, embodied knowledge, networking, a glass of wine, refreshments and lots of fun from just £85 (Slow Textiles Group Members’ price)! Previous articleUncategorizedThe 1920s-inspired Geometric Florals Workshop on 29th June 2014! Next articleUncategorizedTHE GEOMETRICS: VOLUME 2 || TEXTILES EXPERIMENT RESEARCH VISION || opens this evening at 6pm at SLOWstudio!